A: Huh. Of all the complaints I've ever heard people voice about the Hulk -- and in six years of writing about comic books on the Internet, I've heard a lot -- "he's boring" is not one of them. 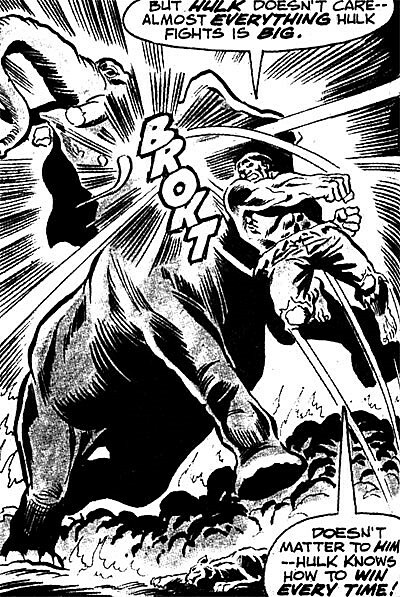 I mean, this is a character who defines "winning" as "dragon punching an elephant so hard its tusks break off." What could possibly be boring about that? Admittedly, while I like the Hulk just fine, he's not one of my all-time favorites, and I can definitely see why the basic idea might not sound appealing to everyone. When you boil it down to the essentials, "guy is faced with a problem, guy gets mad, guy turns into a monster and smashes something, monster turns back into guy, guy goes shopping for new purple pants" seems like a formula that would get real repetitive, real quick. And in a lot of runs, it does. But really, you can say the same thing about, say, "detective in Dracula cosplaly punches the mentally ill at night" or "Superman's friend gets into and out of hijinx three times a month," too. When you boil anything down to its bare-bones component, you lose the things that make any story distinctive. With the Hulk, there's actually a lot of psychology involved there. Putting aside the fact that he's a walking metaphor for the horrors of the nuclear arms race, most stories about Bruce Banner are stories of a man at war with himself. There are ideas in there about repression and frustration, and it's one of the few characters that actually functions as a reaction to the traditional super-hero role as the power fantasy. The Hulk is the biggest possible power trip, turning into an unstoppable engine of destruction whenever someone wrongs him -- but there are definite consequences involved for the things he does. Even at the best of times, there are still two distinct halves of his personality that mostly outright hate each other, and that sort of man-versus-self set-up for conflict can lend itself to some very interesting stuff, especially when it's literalized to include smashing. The very idea of having a character whose biggest defining characteristic is that he's insanely strong is one that's been lending itself to grand, over the top storytelling since Heracles was punching out lions and dropping sleeper holds on the Hydra. By its very nature, that's something that makes creators want to go more and more over the top, with each one attempting to outdo the stuff that came before, which by all rights should be the exact opposite of something boring. It might not always work out that way, but when it does, it makes for some extremely exciting comics. 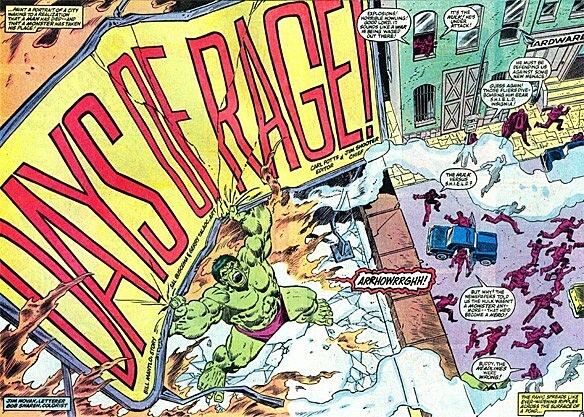 If I had to point to one in particular that captured all this, one comic that I'd hand to you and say "hey, if you don't like this, you will never like the Hulk," then there's no question: Bill Mantlo and Sal Buscema's Incredible Hulk #300: "DAYS OF RAGE!" That's right, everybody: The exclamation point is part of the title. That's how you know it's good. 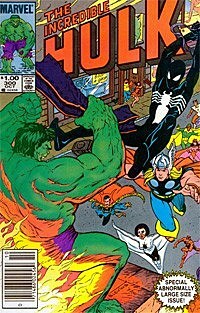 As you might expect from the fact that it was both a "special abnormally large size issue" and #300, "Days of Rage" was a pretty big deal, and even a quarter of a century later, it still ranks as one of the biggest pure fight comics in Marvel history. But there's another aspect that I think is really interesting about it. This story was released towards the end of Mantlo's 72-issue run, a long tenure on the title in which he'd put the character through five years' worth of adventures, introducing new characters and even building him up in the pages of ROM: Spaceknight, another book he was writing at the time. He wasn't just trying to top what had come before, he had to top himself. So he wrote a comic where the living embodiment of bad dreams "killed" Bruce Banner and a completely savage hulk rampaged through Manhattan beating seven shades of stuffing out of the Avengers. In other words, it's awesome. And it's one of the best uses of Marvel's New York City, too. When the Hulk starts tearing down billboards and throwing them at crying babies in the street -- seriously, that's the splash page -- it's not just Dr. 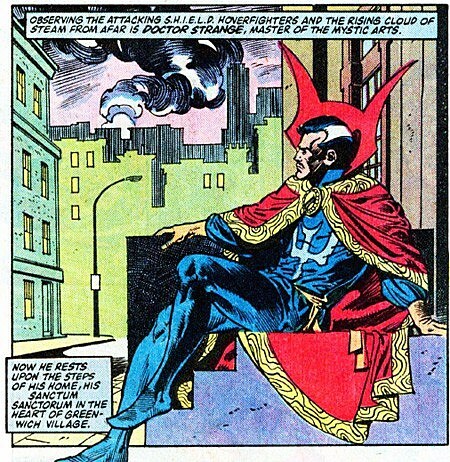 Strange who shows up to stop him, and it's not even just Strange and the Avengers. It's Strange, the Avengers, Spider-Man, Daredevil, S.H.I.E.L.D., Mario Cuomo, the Human Torch, Power Man and Iron Fist. ...and is then quickly punched through a brick wall because that was a stupid, stupid plan. It also plays around with the expected formula: Despite the fact that the Hulk thrashes pretty much everyone he fights -- including a pretty clever way for him to take out Thor without making him seem like a complete chump -- he doesn't win the fight, and neither do the Avengers. Not in the traditional method of "we punched it until it wasn't a problem anymore," anyway. Instead, there's a solution that sets off the next bit of Mantlo's run, which, considering the punch-ups that led up to it, was surprisingly psychological. Unless you count the lead-in from #299, there's not much in the story that involves Bruce Banner or the idea of the Hulk as something boiling just below the surface of a normal man, but other than that, it's pretty much everything you want to see him do. It also set a standard that later Hulk writers would go back to time and time again in their efforts to top. The heroes had been fighting the Hulk since the early days when he first showed up in Fantastic Four, but after Mantlo, things were ramped up. It was only a few years later when Al Milgrom wrote and drew the rematch in Hulk #331 and 332, wherein the Hulk flipped out, fought the Avengers and destroyed an entire town, and there's a direct line from that all the way to the slugfest that was World War Hulk. 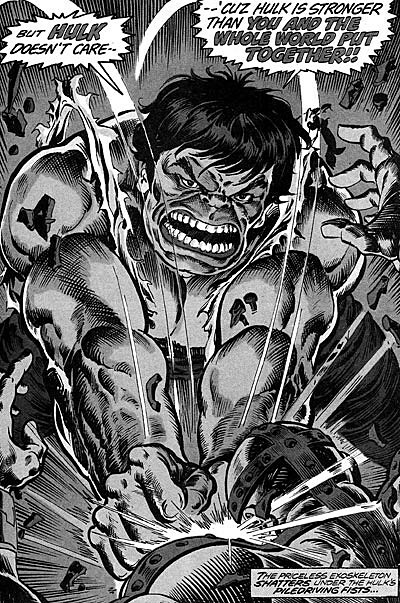 Also, if you get a chance to pick up any of the '70s Rampaging Hulk magazines -- which were collected a few years back in Marvel's Essential line and which provided the black-and-white images above -- I'd check those out. 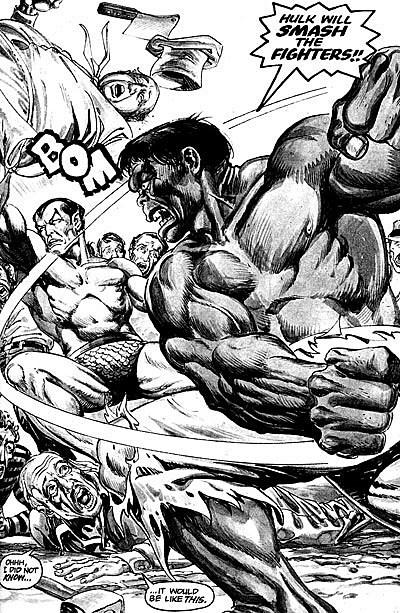 These are, after all, stories where Namor attempts to fight the Hulk by throwing a butcher at him. 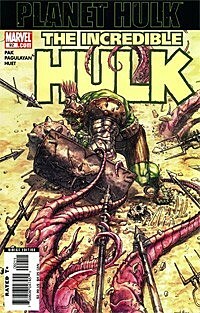 For something of a more recent vintage than Mantlo's run that's all kinds of exciting, I can definitely recommend the Planet Hulk storyline from 2006. It might sound weird for me to say this about a comic where the Hulk becomes a space gladiator, but I actually wasn't looking forward to it when it was first announced. I'd originally assumed it was just going to be an extended retread of the old story where the Hulk went to a sub-atomic barbarian kingdom where Bruce Banner's mind existed in the Hulk's body and found himself a girlfriend named Jarella. There are a lot of similarities in the broad strokes, but Greg Pak -- whose work here launched him to success with books like Incredible Hercules and his current run on Incredible Hulks -- did a great job of not just hitting the same themes, but building them into something new. There's an underlying sinisterness that comes from the Hulk being betrayed and sent to space by his former allies that goes hand in hand with the fact that this was a Hulk who was smart enough to understand just what that betrayal meant. It introduced great new concepts into the character's mythos, too, including giving Pak a platform to bring back Amadeus Cho and offer the really awesome idea of Banner's mind using hyper-math to keep the Hulk's rampages in check. And hey, if you're looking for something exciting that's on stands right now, then look no further than Jeff Parker and Gabriel Hardman's current run on Hulk, which is a sharp, incredibly fun take on the old Marvel Two-In-One formula that's been operating on a big-action grand tour of the Marvel Universe. In the six issues that are out the Hulk(s) go to outer space, Atlantis and Monster Island. 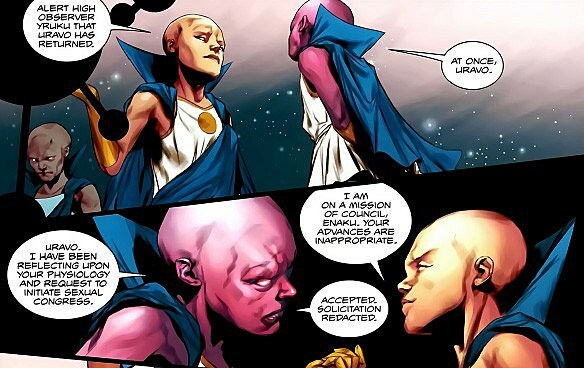 Plus, in a backup story with art by Ben Oliver, you get to see what it looks like when Watchers hit on each other. A: Hang on a sec. Is this an email actually asking my permission to have an opinion? FINALLY! I've been waiting years for the Comics Internet to acknowledge me as its Philosopher King! Who knew it would take an article about My Little Pony to speed that one up? Anyway, the short answer is yes, you are in fact a huge jerkwad for having this opinion. The long answer is no, of course not. You're entitled to your opinion just like everyone else, no matter how wrong it might be. I do, however, think it's disingenuous to generalize the writing of older comics as being quantifiably inferior based on the stylistic choices of the era. To take that to its extreme, it's essentially like saying Charlie Chaplin was a bad fillmmaker because he didn't have a great soundtrack. It's fine not to like reading older comics -- there's plenty of stuff I don't like, and I often find Golden Age books to be a real chore to get through -- but to say that they're intrinsically and entirely without sophistication or complexity is a demostrably false proposition. A: I'm going to assume that you mean a fictional city as featured in a comic book and not a real-life city that's known for its connection to comics, like Portland or White River Junction. While those who know me as the Internet's Foremost Batmanologist might assume I'd go for Gotham City, I'd prefer if at all possible to not be clown murdered. Instead, I'd probably go with Starman's Opal City. The super-villain population is mostly in check, it's got interesting things to see and do, and I'm a big fan of Art Deco architecture. Plus, one of those old DCU Roleplaying Game books had a map setting Opal in my home state of South Carolina, which means I'd still be able to get good barbecue. Plus, there's P-P-P-Pirate Ghosts! Also, go back and read Starman again, but this time give Jack Knight a southern accent. I promise you, it makes that book ten times better. ...but there are none so blind as those who will not see that Superman shooting a tiny version of himself out of his hand and then getting jealous of it and trying to kill it is totally awesome. That's all we have for this week, but if you've got a question you'd like to see Chris tackle in a future column, just put it on Twitter with the hashtag #AskChris, or send an email to comicsalliance@gmail.com with [Ask Chris] in the subject line! And don't forget to download the Ampersands' Ask Chris theme song!